We had our ward Christmas party last night, and look who showed up!! Peyton and Lainey were excited all week that they were going to see Santa. They knew exactly what they were going to ask for. 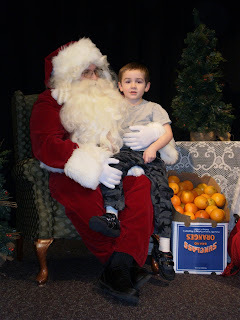 At the last minute, Lainey decided that she didn't like Santa, and wouldn't sit on his lap. 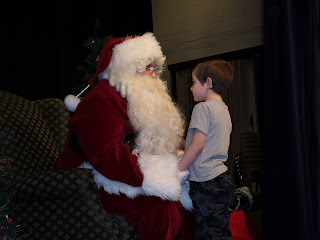 Peyton was so concerned that he wouldn't know what she wanted, that he waited in line again to talk to Santa, so that he could tell him what Lainey wanted. What a cute big brother - watching out for his little sister!! 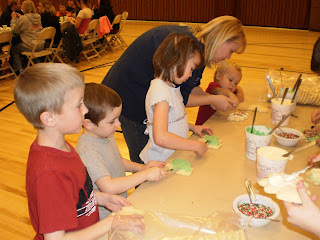 They also decorated cookies (Granny B's!!! )- that was a big hit. All the kids liked that. Lainey just licked the frosting and sprinkles off of hers. That is so dang sweet that Peyton stood in line again!! What a good brother. I can't believe I had my blog updated before you. You are starting to slack. Hope Peyton likes his book! Peyton is so cute! I would have liked to have been at the Ward party- it looks great...and plus, you know I love me some Granny B's! Molly!!! I am so excited for you. of course my mom told me but I kept it secret. CONGRATS!!!! oh and I will bring Brax in soon!